Start the install of EasyPal, some users that have had problems with EasyPal have changed the install folder from the standard install default C:\Program Files\EasyPal to C:\EasyPal The choice is yours. When you have the program fully installed and before you run EasyPal is is best to plug something into your sound card. Some systems will give you a error like above if nothing plugged in. Now lets do some basic settings, from the top menu bar click on "setup" and move mouse over "Setup c/s soundcard-PTT" and move over to "Callsign" and click, Now enter your callsign and click OK. Now do the same again but this time click on "Soundcard". Here you will have a RX and TX list of sound devices, you just highlight the sound devices that you will be using and click "Assign". Now you need to setup how you want the software to key your radio, this all depends on what sort of interface you are using. Most simple interfaces will use "Commport (PTT rts/dtr)" Interface details HERE There are so many variations in doing your PTT that we cannot go into this here but you will be able to work out what is needed for your interface here. Please make sure all filters and DSP ETC is turned off on your radio. Also remember that on TX this is a 100% duty cycle mode so take care with your power level. When this is all setup you are ready to RX your first image, on HF the best place is 14.233. You will need to make some adjustments to your audio level adjustments on your PC "normally this is MIC level, you don't want to waterfall in EasyPal too dark or too bright so start off with a level that gives you a light gray waterfall and make small adjustments from here when RX'ing a file to see what's best for you. When RX'ing data you need all of the "Sync" bar in above image to be green before data is decoded. When it hits the "FAC" and above you will decode the sending stations Call Sign. There are 2 types of ways images are sent with EasyPal. The regular way where the whole file is send via the radio and the time taken by this varies a lot from about 20 seconds up to a few minutes or so. When receiving this type you will see a progress bar at the bottom of the window showing how big the file is and how much of it you have decoded. At the same time in the image above it will show you total segments being sent "Total", how many segments you have decoded "OK Segs" how far through the transmission you are up to "Position" and finally how many segments remaining needed to decode the file "remaining segments". Most of the time you will find a image will appear before the progress bar has reached the end. This is due to the way DRM is sent and we don't need to go into this here. The 2nd type of file to be sent with EasyPal is called Hybrid. This way of sending a file is much quicker but you are not receiving the image via the radio, you are only receiving a short header that tells EasyPal where to go and download the file and display it on your screen, This all goes on within the program. The sending station uploads "FTP" a file to a server then transmits its location and your program grabs it via the internet and displays it. This is nice when the bands are real busy as you have more chance of getting the short header than getting a 3 minute transmission. When receiving a Hybrid image there is no progress bar. Once again EasyPal is a 100% duty cycle mode, do not push your radio into ALC, read your radio user manual about data modes that use 100% duty cycle. 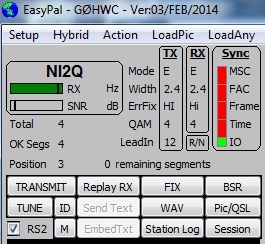 When sending with EasyPal there are many modes of transmission but for HF I find it works best in RS2, Mode E and QAM 4. You will get to understand these modes better over time and chatting to other users of the program. To set EasyPal for these settings can all be done in the top left of the program from the main screen. First RS mode and we need to make sure this is turned on, in the image below bottom left corner it says RS2 and it is ticked. Make sure your box it ticked and then put mouse over the RSx and left click, this will take you through RS1 to RS4, set this on RS2. Now we need to make sure we are in mode "E" in the vertical TX box the first item is your mode and if you click on the "MODE" to the left of this box it will go through all the modes A, B and E, set this to mode "E" now go down to "QAM" and by clicking on this it will take you through 4, 16 and 64, set this to "4". This has no multipathing or doppler effect. VHF is far more reliable than HF, and poor setups quite often are enough. This means Mode “A” and QAM 64 should be ok for nice fast transfers. A less setting of mode B QAM 16 might be a good starter till the TX is cleaned and understood. However, many newbies using FM, overdeviate or overmodulate on TX and this causes many errors. EasyPal has a very large peak to average energy envelope. There are complications also with preemphasis and deemphasis. Also some systems use conventional FM modulation and others phase modulation. But if the TX modulation is under control then these can be ignored. There will be quite a slope on the waterfall. However, if the user knows how to tap into the preemphassis and deemphasis audio, then the waterfall will be flat. Depending on the rig, this audio may or may not be available from the accessory socket. As a rule of thumb, listen to your own voice transmission. Then adjust the EasyPal TX data to be about 1/4 as loud to the ear.This seems a large reduction, but absolutely necessary. A strong distorted signal is useless. I find the easiest way is to just use drag and drop, click on a image you want to TX, drag it to your TX window and drop it there. Now when you have done this you will notice a scroll bar appear at the bottom of the image, this slider will allow you to adjust the quality of the image but higher quality = longer TX time. If you try dragging the bar from side to side you will see this shows you the size it is adjusting the file to in K and to the left of this it will tell you how many seconds it is going to take to TX this image. If you set this too low the image will look poor, try dragging it right to the bottom and press the "SET" button, this shows you how it will look when others receive it. When you have decided on a quality and you are happy with the amount of time it will take to send this image just press "SET" again. 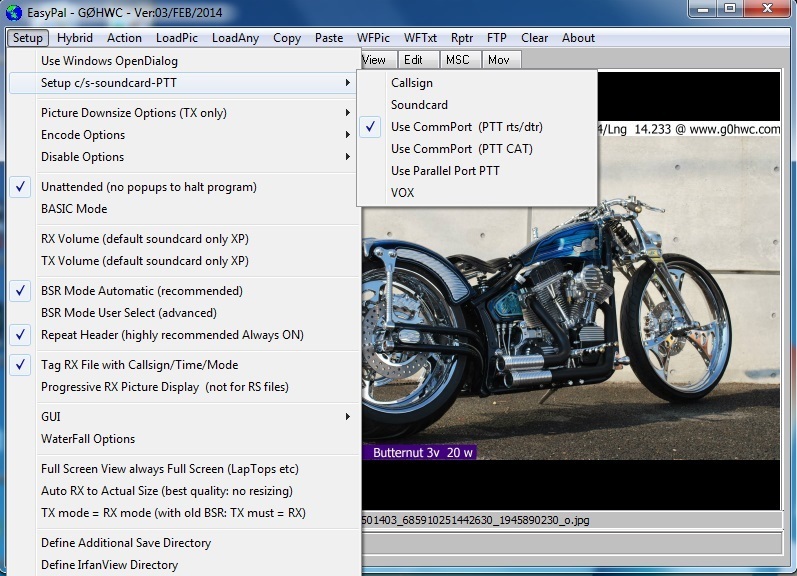 Now before you click the "TRANSMIT" button you should have your power ETC set on your radio and be ready to adjust your TX audio from your PC, normally this is the "speaker volume" within Windows and this is best kept very low before you start your first TX with EasyPal. Now start the TX by clicking on the "TRANSMIT" button and adjust the output from the PC so as not to over drive your radio. Hopefully after a few trials others will receive your images. To send images in Hybrid mode is much like above but there is no adjusting of the image quality ETC. All you need to do is click on "Hybrid" in the top menu and put a tick next to Hybrid then follow above. 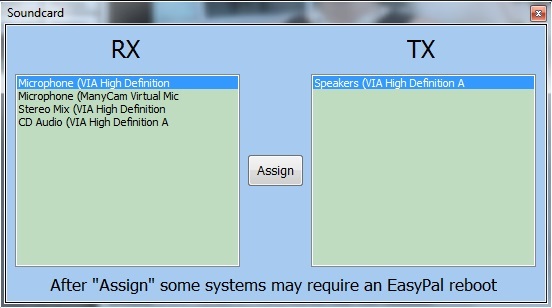 In receive EasyPal with RX both Hybrid and regular without and changes but in TX you will need to tick and un tick the Hybrid depending on what you want to send. EasyPal can let others know that you have receive one of their images. 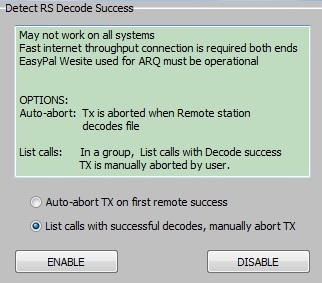 From the top bar click on FTP then click on "Detect remote RX decode then stop TX. 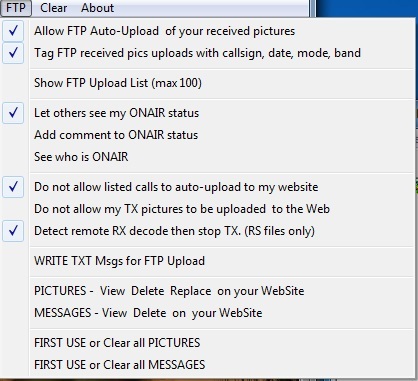 (RS files only)"
This will bring up this window below, click on the "List calls with successful decode" and click on "Enable"
Now when sending images if the RX station has set this the same as you, then you will get a box appear at the end of transmitting your image listing all stations that received your image. I hope this has not confused you too much and I hope it has been of some help to you. The best of help you will find on air, so just ask for help. Ham radio is full of experts !!! hi !! !